Yamabushi are the ancient mountain priests of Japan. Their traditional role was to help guide people to their true nature and to teach discipline and warrior ways. This year Megurun Inc and Daishobo – a pilgrim lodge in the foothills of the three sacred mountains of Dewa Sanzan, Yamagata Prefecture. 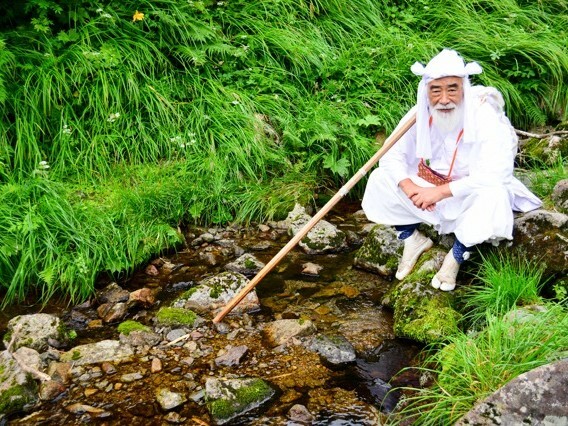 – are launching Yamabushido, a new mountain training program aimed at a non-Japanese, international audience this summer. “We realized that many people have tried meditation and other mindfulness practices in their lives, but also realized that Yamabushi practices offer something different, something more powerful, and something which – although it has been practiced for 1,300 years has never been more relevant," says Takeharu Kato, Megurun Inc.
"Yamabushi training is the simple philosophy of placing yourself in nature and feeling, not thinking, in order to rejuvenate back to your true self. Yamabushi training is quick, practical, and effective, and provides a powerful context in which to resolve any challenges, questions, or decisions that need to be made. It has been used for centuries to provide space for consideration of the challenges of the modern-day person, an important role in the current age where people are becoming busier and busier and are looking for the chance to revitalize. "Yamabushido is a new word that we are using to describe the wider practice of the Yamabushi, as we explain it to an international audience. It includes not just the mountain training, but also the philosophy and the values of the Yamabushi. The aim of Yamabushido is to provide something for international guests that they can use powerfully even after they have returned to their ordinary lives. Initially, this summer we are launching two programs; a three-day Basic Yamabushido Training, and a five-day Extended Yamabushido Training." In order for everyone to have a powerful intimate experience, maximum group size is 10 people. Price: 150,000 yen/per person An additional 8% consumption tax will be added to the program total. Founded in 2011 by Takeharu Kato after leaving Hakuhodo and moving to Tsuruoka City. It enables the local region to become more active on the global scene, and promotes the use of renewable energy to enable a sustainable life in the local region. Ouch! While I would love to join, it is a bit too dear for my taste. In am interested ...but not for 150,000¥ worth of interest. self discovery for 150,000Yen. Love to meet some of the customers. They could probably charge even more. The self discovery types are all spoiled trust fund babies who have both the time and money to indulge in such things and think that life is so difficult because daddy wouldn't buy them a new lambo because of poor grades from shooting up too much. Beware, always, of the "truth-seekers" of the world. They will not be coming to Japan to grasp cultural meaning or insight - simply to find answers to problems that self-absorption and consumerism have wrought into them. Yamabushi training is quick, practical, and effective, and provides a powerful context in which to resolve any challenges, questions, or decisions that need to be made. And this company does not represent the true insight of the yamabushi of old. Beware of any institution or retreat that claims to be quick, practical, and effective." How can a refined, conscientious way of thinking be found in a three or five-day stay? It's impossible. It takes the greatest zen masters, Hakuin or Dogen for example, years - and for the most dedicated practitioners their whole lives - to be able to understand how to honestly confront live's problems. Headline is a bit misleading....they offered a similar thing for free back in the early 90s....maybe it should read, "Yamabushi decide to charge foreigners for training for first time in 1300 years". If I discover myself, but don't like what I discover, can I get a refund? If you have to search to find yourself, you never will. I'm with Nan Ferra - it's the first time people are being charged (quite a lot) for the experience. I actually took part in one of the earliest tours, back in 1993, but it was only two or three days long. I assume this is a longer experience by the price. I sure hope so - the food (rice and miso shiru three times a day) certainly doesn't cost much. To add to that, it wasn't free back then either, but it was quite a minimal cost. I just can't think with the word "self-discovery." I mean, in order to discover yourself, WHO is doing the looking? I can understand someone discovering something, but how can YOU discover YOU? And what happens when you discover YOU? "OOH LOOK! There I am! Hello me! Cooee!" I think 'self disvovery' should be 'self realisation'. Accept yourself for who you are not for who you want to be. People spend that much on frivolous entertainment, but in what way is this program "sustainable"? It relies on customers from the unsustainable and collapsing social and economic model we live in. Perhaps as we collapse further, people will see the need to reassess their life paradigms in which case this experience could be most useful - if there are people who can still afford it at that point.